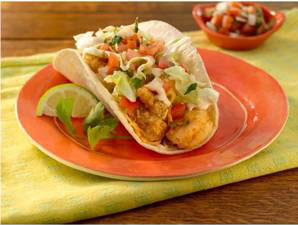 Taco Del Mar brought back crispy shrimp, a favorite summer menu selection for its popular tacos, burritos, and salads. Paired with a new flavorful and spicy chipotle sour cream sauce, Taco Del Mar’s crispy shrimp can be added to any menu item and will be available until September 8. The company is also tapping its social network to help name its next new, seasonal menu item for the fall, which will feature pork with pineapple salsa in both tacos and burritos. Requesting input on its Facebook page, the individual that provides the winning name will receive $100 in Taco Del Mar gift certificates. The contest ends July 16 at midnight PDT and the newly named fall menu item will be revealed later this month. To participate in the Taco Del Mar fall menu naming promotion, customers hould “Like” Taco Del Mar on Facebook and post their best ideas to the comments section by July 16.